Madera mala for a short sustain guitar? If you have watched my youtube video comparing a classical to a flamenco, you have seen my approximating a short sustain guitar using Gene Clark's trick with a piece of tape. That kills the guitar's sustain, but it also kills its brightness. I describe the voice of a guitar by what it invites me to play on it. My favorite palo is soleares, and my favorite guitar is one that seems to want to play that. And a guitar with that sort of "lyric voice"---singing, if you will---is probably the most versatile. However. I would love to be able to build a guitar with quite a different voice. The closest that I've come across was an old de la Chica blanca, owned at the time by Craig Carter of LS redwood fame. It shut off right away, was not very loud, and could be over driven fairly easily. It invited the ends of the flamenco spectrum---siguiriya and bulerias. For bulerias the rasgueado was crisp and well defined, even when playing it at fast tempos---it really cooked! For siguiriya---funeral music---at a really slow speed, it seemed to be all choked up with grief. For that guitar's present owner I tried to achieve that sound with my #30 cypress classical, and didn't even come close! So, I have repeatedly come to the conclusion that I was going to have to build a blanca with "madera mala"---low grade stuff I wouldn't ordinarily use, and build super light-weight. That takes courage! What if the guitar just turns out to be a dud? It *might* turn out to be a dud. But it’s no secret that a lot of what is considered low grade wood on the shelf can actually be very high grade when it comes to all the other important qualities, save visual. I think if you select well aged wood that meets your normal criteria for good tonewood then you’ll do fine and end up with a funky looking guitar that sounds great and is muy flamenco. I think that’s what my friend in Sacromente was getting at when he was talking about Madera Mala. He just wanted something which sounded great that he wouldn’t be afraid of kicking around with, kind of like a stealth souped up car. But maybe I’m wrong, although I do know he can be pretty critical of guitars that don’t meet his fancy, and it doesn’t seem to matter where they lie on the price spectrum or the nature of their provenance. Second to last time I was in Spain I met a guy playing a very beat up Gerundino that he had pulled out of a dumpster in Almería and had gotten repaired/restored. The maker who repaired it didn’t seem to doubt its authenticity, he more or less shrugged and said these things happen sometimes. Based on what you seem to be aiming for sonically, one thing you can try is to very slightly thin the top in the bridge area, in relation to the general thickness. It seems to help increase articulation. This is not a new concept, it’s been mentioned on here a couple of times by Tom, and I’ve also encountered it in conversations with other good flamenco makers. I’ve tried this myself and have been happy with the results. Also, thin sides seem to help getting what I think it is you are looking for. But whenever I think I’ve figured out “the secret”, something comes along that blows the whole theory out of the water, so it appears there are many ways to skin the proverbial cat. I still have to fix the .pdf links---they work for my computer guru. When I first started testing my wood I was blown away by how much variation there was, and by how little the wood supplier's grading had to do with the wood's suitability for building a good instrument. I'm well aware that my approach doesn't appeal to most builders, but it seems to be working well for me. Richard has mentioned that he has a guitar with stellar characteristics that has top wood that could be considered lower grade in appearance. While I really do like to minimize runout when I select a top, I think some of the cosmetic characteristics that are considered desireable in the marketplace are more the invention of dealers and don’t necessarily have a huge influence on the sonic quality of the wood. In other words, I agree with you regarding cosmetics. But I’m not convinced you’ll be happy with a guitar you make with low grade wood using the criteria you just described. Only one way to find out, I guess, I think it should be a fun build and informative too, regardless of the outcome. Best. Edit - I should also add that one of the best builders I know has all sorts of ideas about wood characteristics that fly in the face of convention and he consistently makes killer guitars, he’s made well over 1000 at this point in time. So I firmly believe in keeping my mind open about these things and there is a good chance you’ll make something awesome! I've been in small business for around 60 years so I have every sympathy with wood suppliers. They don't have more than half a minute to spend grading a top. And if they were to supply tested wood at a premium, everybody would want the best stuff, and they would get stuck with the lower grade material. An example: I ordered 10 spruce tops from the Swiss supplier that advertises "moon wood". They seemed to have a good reputation. They were out of their master grade and their next grade down, so I went for the grade below that. The price was around $42 a top, including freight, so I decided to take a flyer on it---I certainly wasn't going to send any of it back! I tested the 10 tops, and 9 of the 10 tested well enough that I would build with them. So a friend ordered 10 master grade when they became available. Four of the master grade flunked my tests, and those that passed tested poorer than my "lower grade" wood. Wood testing is the "bean counting" end of guitar making, and is something of a chore to do. But I think it's one of the most important parts of making a really good instrument. When I said dealers I meant people who sell finished instruments. The wood suppliers are just trying to meet demand and avoid returns, IMO. Some are very good at quickly grading wood, as they are often involved in the process from tree fell to slice, and in some cases can be very expert and reliable. It’s just a matter of letting them know what you want, otherwise they have no choice but to default to cosmetics. I think most of the wood grading that goes on is only concerned with the visual aspect of it. I have used lots of grades of wood and lots of ungraded wood and gotten consistently good results. Yesterday a guy brought in a guitar that needs adjusting. The latches on the case gave me the impression that the case itself cost more than one of my guitars. Inside was a brand new Hauser III classical guitar with the most stunning spruce soundboard I have ever seen. It had bear claw all over the bear claw. The guy told me that the soundboard was 60 years old and the Brazilian rosewood back and sides 70 years old. The Spanish cedar of the neck had the most beautiful grain pattern I have ever seen in Spanish cedar. (The fingerboard was boringly perfectly solid black.) I thought the guitar had weak sound overall and when the guy played one of my classicals he was shocked by the difference and at first thought mine must have been around a long time and opened up, but that was not the case. I don’t know if that Hauser was an unfortunate example. It may well be the case. There is anyway to say that Hauser guitars are usually particularly closed and thinny sounding when new or unplayed or even played improperly because of the very thick top. That’s the common hearsay about Hauser guitars at least. A friend luthier (quite successfully making Hauser copies) told me he had to introduce a lighter guitar model (in his case a Torres model) for his customers with a light touch or just not fit for a temperamental instrument like a Hauser like instrument. What I’ve learnt is that the right choice of the top wood is definitely a luthier skill on its own. Wood dealers often categorise a certain wood according to the (estetic standard asked by the big buyers, which often are companies not working as an artisan would do. John Gilbert used to tell the story about receiving a stack of western red cedar tops that was packaged between the halves of a reject top. That top was rejected because of some cosmetic defect. John tested it, it passed his test, and he built with it. Received wisdom about Hauser I is that he built seven guitars for Segovia before getting it right. The 1937 Hauser as documented by Richard Bruné is built like a tank, and Fred Noad told a story about its being heavy and with high action. Segovia was a strong player, and needed a guitar that could be driven hard, and be heard in a large venue. I suspect that the Hauser tradition continues. Another anecdote is that the Hausers finish their guitars with varnish, and give them a year to cure. My experience with oil varnish is that it kills treble. You want Spanish sound? Finish with shellac! Interestingly, the same tradition exists in harpsichords between Italian lightly constructed, bright sounding, quick and easy response, and German ones at the other end of the spectrum. The Flemish ones are considered the best, and I'm guessing that they are somewhere in the middle. Well I have hauser II 1968... and have compared it to 1960 and 1971 examples. My father bought one from the maker and sold it soon after because it didn’t sound good. The 1968 I have he bought from a second hand shop and sounds amazing, to him at least. The lacquer is extremely thin on the top and completely rubbed through to the wood in spots on the back. The guitar is pretty light weight, and to me is excessively bright and “alive”, meaning soft playing has amplified string noise far above any of my Flamencos .... however I would not call the guitar loud volume wise or necessarily far projecting compare to an average Conde negra say. These things people always discuss are relative when compared to other factors imo. All guitars are as quiet as various speaking voices. The playability is very soft, I use hard tension savarez but keep it tuned 1/2 step low because I don’t play it often. Bridge is double height of a flamenco from top. The guitar is over compensated resulting in sickeningly sweet intonation, nice for baroque music I guess. That is a very beautiful guitar. If you’re ever in the mood to post pictures of it in the Lutherie section I’m sure we’d all love to see more of it. You sound great on that Hauser, Ricardo. The dealer shipped the '73 Romanillos to me in the Marshall Islands for a week's trial. We made sure it was insured independently from the shipping company. When I got it I thought there was something wrong with it. It was tinny and quiet. By the end of the week, I was beginning to think there was something interesting in it. I asked the dealer whether I could keep it over the 4th of July 3-day weekend. He said yes. I decided to buy it. But I would not have if I hadn't thought I could flip it to Japan at a slight profit. After I had played it for a month, it was displaying some liveliness, and a nice variety of tone color. I got out the spruce/Brazilian Contreras Sr. "doble tapa" I had been playing, to see how much louder the Contreras was. The Romanillos was notably louder. In a phone conversation with the dealer (Bruce Bannister, who played Romanillos guitars professionally) I mentioned my experience. He said he wasn't surprised. The guitar had gone unplayed for several years, and needed to be "waked up" again. An expert says the Romanillos was "modeled on" a 1950 Hauser. (I don't remember which one of the 3 I talked to.) It has a fairly thick top. It is finished in shellac. It can have that Hauser "edge," but played a little more over the sound hole it has a much sweeter and fuller sound. These days I would say the Romanillos is my best classical, though I play Blackshear's Rodriguez model more often. You want Spanish sound? Finish with shellac! I often wonder about the idea that traditional Spanish guitars were often finished in shellac. According to Romanillos' book, Torres finished his guitars with varnish. Robert Ruck has used marine varnish, among other finishes, as have I, with excellent results. I don't even believe that the type of finish is an important acoustic factor as long as the coating is kept thin. I do French polishing because health-wise it is the safest finish for me to use in my shop and it doesn't require a dust-free environment--and because there is this myth, which I consider it to be,...what you said. I don't even believe that the type of finish is an important acoustic factor as long as the coating is kept thin. I remember sitting down with a pile of Conde A26 guitars in the old Feleipe V shop when the brothers were still working together. It gave an opportunity to test FP vs synthetic finish guitars, all in the same environment. To me, all the synthetic finish guitars had a distinctive 'colour' to the sound. While I preferred the sound of the FP guitars there were other more important issues for me in choosing a guitar So I agree that it is not very important but I do think that there is a difference.. I have a number of things that are on what I call my one percent list. Things like hot hide glue, shellac, rosewood fingerboards, etc. These are things that I think make a difference, but that would be difficult to prove---anybody want to fund a research grant? I figure that if I do everything on my one percent list, I'll end up with guitars that are a few percent better, and that musicians will be able to tell the difference. Ervin Somogyi, one of the best steel string builders alive today, says that his guitars sound better when they are French polished than they do when finished with nitro cellulose lacquer. Ervin, by the way, is an excellent flamenco guitarist. The Arcangel, that I loved so well, had a French polished soundboard, and lacquered back, sides, and neck. I'm a "latest developments" type of guy, and have no objection to anything new that I think will make a better guitar. I just happen to think that shellac is the best for sound because when it finally cures up it is hard, and doesn't damp the treble. That very hardness is why it isn't as durable as other finishes. I had an opportunity to compare finishes at the shop of Arturo Huipe in Paracho, Michoacan, Mexico. He had two spruce/cocobolo classicals. They were as near identical as I could tell from visual inspection. Both the body and soundboard woods exhibited very similar grain patterns. They weighed the same, as nearly as I could tell by holding them. Huipe said every effort was exerted to make them identical, except for the finish. One was French polished, the other was sprayed with nitrocellulose, fairly thinly. I should mention a mysterious (to me) aspect of the guitar business in Paracho. Many competent luthiers, such as Huipe, have more guitars in stock at their workshops than they could reasonably be expected to produce themselves. At Huipe's shop the instruments show very precise workmanship. I suspect there is at least one workshop employing multiple workers which contracts to various luthiers the production of their designs, maybe more than one such workshop. At any rate, the Huipe guitars seemed nearly identical, except for the finish. The French polished guitar was far superior in loundness and complexity of tone. For $1800 I thought it was a very good guitar for the money. I bought it. I would not have considered the nitrocellulose instrument, priced a few hundred dollars less. When I got the guitar home, it didn't measure up to other classicals that I had, and it didn't get played much. After a few years I gave it to the Austin Classical Guitar society, who lent it to a student. She used it to audition for admission to conservatories and university classical guitar programs. At some point the society gave her the instrument. Now she uses it in her studies with Adam Holzman's prestigious studio at the University of Texas here in Austin. Hey, you didn't say before that you were in Texas! I grew up in Mission and McAllen, down in the Rio Grande Valley---still think of that as "home". There are so many variables that to be sure about the relative merits of finishes would take some serious work. The biggest variable is the wood. I just spent Thursday and Friday selecting top and back wood for my current batch of six guitars. If you have watched the videos on my website, you will remember that #24 has a cedar soundboard made from "grampop's shelves". The other soundboard from that 3/4 inch thick board has quite different stiffness characteristics from the one in #24---they look identical. South Texas is quite familiar to me. I was born at Fort Sam Houston in San Antonio. My father made a career in the Air Force. His family has farmed and ranched in Willacy county for four generations. I spent every summer there from age 4 to age 17. Previously the family lived near Angleton on the Gulf coast of Texas. The eldest son of the eldest son..(etc.) still lives in tidewater Virginia where our immigrant ancestor Thomas settled down in 1635. Two of Thomas's sons were founders of Chowan county in North Carolina, and my line of younger sons pretty well kept moving westward from there with the frontier. Interesting that two boards which grew so close to one another should differ so much in stiffness. Were they from sufficiently different depths in the 3/4" board so that may have had an effect during its career as a shelf? I have mentioned here previously that the Paracho luthier Abel Garcia showed me some wood Romanillos gave him after he assisted Romanillos for the second time in his summer course at Guijosa. The wood looked just like the top of my '73 Romanillos, and also like the top of Bream's famous '73 Romanillos #501, which I saw up close. Garcia said it was very good top wood, but its appearance would be seen as undesirable in today's market. I am very happy with the spruce/Brazilian classical Garcia made for me. Its top has very fine, straight, uniform grain with lots of medullary ray "silk." Garcia showed me a cabinet where he exposes tops to ultraviolet light for some period of time, to give them a little color after he thicknesses and graduates them. In my experience thin nitro sounds very similar to FP. Maybe I tiny less open in overtones and more focused. Romanillos made a copy of a ‘41 (I go by heart here) Hauser belonging to Sergio Abreu. He happened to inspect the guitar together with Julian Bream when Abreu was in England. Abreu asked Romanillos to make an exact copy of the guitar and he himself drawn a very precise plan of the guitar which Romanillos received by post. That guitar was a peculiar Hauser (fairly thin top, open harmonic bars, domed top, smaller plantilla). Romanillos made an exact replica of that Hauser but adding some little doming to the top longitudinally. That guitar ended up in being the favourite guitar of Bream for 15 years. Later on Bream fall in love with a ‘40 Hauser belonging to Augustine’ widow. 2 lines more about Hauser and Romanillos. Hauser 1 guitars before ‘40 usually have a lower pitched box air (Helmotz freq), and different building features like thicker and flat plates. Hauser still used to use 2 different plantillas; a small one drawn from the Torres of Pujol and his regular one. From 1940 Hauser1 started making lighter guitars with more domed tops and experimenting with bracing. The Hauser belonging to Abreu used to have the Torres plantilla (by chance the same plantilla favoured by Santos and after Barbero and Arcangel) and the open bars found in Torres. Anyway there is a certain evolution in the guitars of Hauser 1 and his heirs. The 73 Romanillos belonging to Hauser was fairly light and delicate, strutted with light bars. At a certain stage the top collapsed and the 3 central struts were replaced with more robust ones (which Bream seemed to prefer). Comparing the plan of the first Romanillos with the last ones (I have his book) it’s noticeable that the guitar became stronger (thicker plates, underbridge patch; box air tuned at G flat). Coming back to the original thread question. Instead of using bad wood; why not to follow a plan of a de la Chica guitar? There is a drawing of a top of a De la Chica guitar in the book “the Granada school of guitar makers”. I see Marcelo Barbero (and the Madrid school after him) like the Hauser (37 Segovia Hauser in this case) of flamenco for the use of the thick top vs the more traditional thin top guitars built in Andalucia. Kevin Aram gave a talk to the Guild of American Luthiers about Bream's Romanillos #501. It was published in the Guild's Journal. Aram interviewed Romanillos. Romanillos said he built #501 as a trial run for the copy of Sergio Abreu's Hauser. Abreu and his brother Eduardo performed as a duo, and they wanted another instrument like the Hauser. When the guitar was complete, Romanillos took it to Bream for his comments. Bream was in the kitchen of his house at Semley, talking to his agent. Bream said is was a nice guitar, "perhaps a little quiet." Romanillos said he was a little ashamed of the guitar, and put it to one side. A few months later Bream and John Williams visited Romanillos at his workshop in Fontmell Magna. Williams wanted the tuning machines replaced on his Fleta. #501 was hanging on the wall of the workshop. While Romanillos worked, Bream took it down and played. Williams commented that he sounded very good on that guitar. Bream asked to buy it. Romanillos immediately agreed. Romanillos said to Aram that he had never before told anyone that the guitar was already sold to someone else. He had to call the previous customer to persuade him to take a later guitar. Romanillos's numbering system might be a bit confusing. #501 was not the 501st instrument he built. Rather it is the first of the fifth design series. Mine, which just precedes #501 is #473, the 73rd of the fourth series, "modeled on" a 1950 Hauser. I vaguely recollect that #501 was not labeled as such until some time after Bream had begun to use it. I had a close look at #501 when Bream came to Austin for a concert. It looked like it had been "rode hard and put up wet," as we say in Texas. I saw and heard it in his hotel room, at the concert, and in a fair sized room in a private house. After it cracked, the back was replaced by Hermann Hauser II, since it was considered that he had a better stock of wood. A little unusually for Romanillos, #501 has Brazilian rosewood back and sides. They say that the 1940 Hauser lent to Bream by Rose Augustine received similar treatment. Segovia used to stay with the Augustines when he was in New York. The Hauser was made for him and sent to the Augustines. Segovia kept using the 1937. After he passed away, Mrs. Augustine lent the 1940 guitar to Bream. Rose Augustine also lent a guitar to Alice Artzt. On the cover of an LP that Artzt recorded with it, the guitar was said to be by Antonio de Torres. Later examination by Richard Brune showed that this was not the case. All the same, it sounded quite good in the hands of Ms. Artzt. I'm reminded of what Brune said about Santos Hernandez: "Of the 400 or so instruments he made during his career, probably no more than a thousand survive." Manuel Ramirez was one of the Torres counterfeiters, though I don't believe Augustine's guitar was one of his. Ramirez made a few Torres copies, put his own labels in them. then pasted fake Torres labels over them. The leading guitarists, both classical and flamenco, hung out at Ramirez's shop. Trying the fake Torres and some of Ramirez's other guitars all agreed that the Torres were the best. Ramirez then removed the fake labels and showed his own underneath. Yes, the Gal issued an American Lutherie journal with both the report of Aram on the ‘73 Romanillos, which you mentioned, and the plan of the guitar. The label was changed by Romanillos when he replaced the back (the back has been replaced 3 times because Romanillos didn’t use to build in a controlled humidity environment). In my opinion, the intriguing aspect is the evolution of that model of guitar though. Bream was a big fan of Hauser and of course Romanillos followed Hauser’s track at the beginning of his career. The first number of the Label refers to the plantilla used as reference by Romanillos. Later on Romanillos was intrigued by santos and Torres and turned his building towards something different, by developing his Hauseresque guitar model towards a more Spanish sounding guitar. He actually uses his famous bracing pattern on a plantilla of Santos and his guitars of the last 30 years have few in common with Hauser. That’s why you may find fans of the first guitars of Romanillos (usually also fans of the early Hauser guitars) and people more fond of his later production. Both Hauser and Romanillos are giants of the lutherie. Having said this, I don’t forget that Segovia preferred his Ramirez.... nowadays there is a kind of Torres, Hauser etc. fashion but at the end of the day each guitar speaks for itself. Isn’t it? I had never heard that joke of Bruné's---made me laugh out loud! 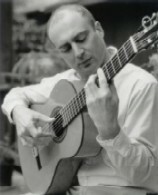 The late Craig Carter---classical guitarist, and would have been guitar maker---lived in Petrolia CA. That's right in an area full of Coast Redwoods. He found the down log of a tree that had grown up surrounded by mature trees so that the only light came from directly overhead. Redwood ordinarily follows the sun, and grows with a twist. This one grew perfectly straight---a so called "splitter". Hence its name: LS---log splitter. The wood from the LS log is extremely fine grained and Craig always sawed his sets working from a split billet, hence virtually no run out. I bought as much of it as I could, even borrowing money to get some more. As even and consistent as the wood from that log is, the density varies from 26 to 31 pounds to the cubic foot---nearly 20%. Stiffness and damping vary even more. Redwood shares only a similar color with western red cedar---its more like spruce on steroids. I've built two classicals and a flamenco with LS tops. Classical players find them too bright. The flamenco---completed a few months ago---is a cannon, right out of the starting gate. It belongs to Dave Borson of www.borsonresaw.com, here in Fort Bragg. I really must go visit him and the guitar to see how it's coming along. BTW his other guitar is a 1964 Gene Clark that he commissioned---in 1964. The videos give a general idea of what I do, and the .pdf's give more details. The links are at the end of the text that goes with each section.